One of the most vital accessories for scuba diving is the mask. It protects your eyes and nose while in the water while still allowing you to see clearly. However, with so many items on the market, which one is the best? Both beginners, as well as professionals, ask this question. What may be suitable for you may not be right for another person. For instance, a wide type will perfectly fit on your large or round head but will allow water to seep through when worn by a person with a small or slim head. It may offer good visibility and comfort but the glass may not be resistant to scratch or may require defogging too often. 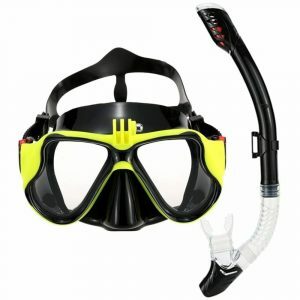 In this top 10 best scuba diving masks in 2019 review, we will guide you on the important features and later on list the top products on the market. Material: It should be made from a strong, comfortable, durable and scratch-resistant material. Tempered glass, silicone, and rubber are the common materials. Size: It’s crucial to go for a mask that perfectly fits on your head. Too large and water may penetrate through the sides. Too small and it will feel tight and uncomfortable. Scratch Resistant: In addition to offering good clarity, the glass face will be resistant to scratching or breakage. Nose Enclosure: This aids in the removal of water while preventing it from going through the nose. Fog Prevention: A good piece doesn’t fog easily and when it does, it’s easy to defog or clean. You can nonetheless take measures to reduce the possibility of fogging. 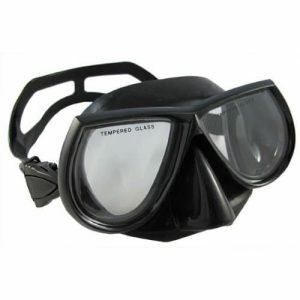 This black /white dive mask measures 6 x 7 x 9 inches and is suitable for scuba diving and snorkeling. The light item weighs 0.8 pounds, constitutes of clear tempered glass for easy viewing, and comes with a modern low profile for comfort. The elegant piece features a sturdy and transparent silicone skirt for comfort and an easy-to-adjust non-slip strap. Cleaning the open-view single lens is easy courtesy of the low volume design whereas the frame-less design makes wearing and removal easy. It’s worth buying because it feels and looks great, has good sealing, and is also comfortable. It, unfortunately, may be a bit large for small heads. You shouldn’t struggle to see when snorkeling or scuba diving. What you need is this red/black mask that comes in a 4 lens panoramic design and features high-quality silicone and tempered glass. The lightweight piece consists of a poly-carbonate frame and weighs 0.75 pounds. It’s also very compact and measures 4.1 x 5.4 x 7.8 inches. Its ergonomic design plus high-quality silicone makes it perfect for a range of faces both large and small. For an unrestricted field of view, it features side lenses while the user-friendly straps make adjusting simple and easy. It’s picked by many because of its good sealing, lightweight, good clarity, and comfort. However, it’s not very fit for small heads. Fancy a yellow scuba or snorkeling dive mask? How about this elegant and handy piece by OBOSOE? Measuring 3.1 x 5.5 x 15.8 inches and weighing 1.15 pounds, this silicone mask should fit on most faces. It comes with comfortable and easy to adjust straps while the comfortable face skirt prevents water from entering. The support and water tightness is further improved by the ribbed design whereas the anti-fog tempered glass ensures you have amazing views. Also featured are a splash-guard, purge valve, UV, and impact resistant glass. Consumers love the 100% leak proof nature, easy wear and removal, good comfort and streamlined design. Some, unfortunately, say it may feel a bit tight when new. 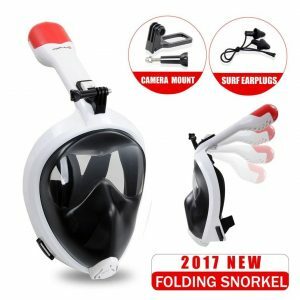 With this white snorkel and scuba diving mask, you will enjoy great viewing. 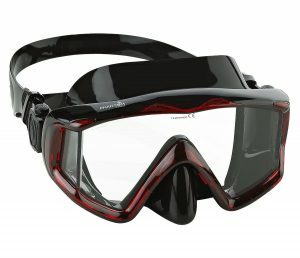 It’s made from anti-fog and shatterproof glass lens, and quality and comfortable silicone skirt. The 11.4 x 4.5 x 7.5-inch mask weighs 1.3 pounds and is designed for mature kids and adults. Unlike other types that require frequent defogging, this piece never fogs courtesy of the advanced anti-fog technology. It also comes with a folding snorkel for improved breathing, a detachable camera mount, and surf earplugs. It makes it to this list because of its solid and fog-free nature, easy to wear and great fit. It, however, is a little big for small kids. Made from tempered glass and featuring a comfortable 4 3/4-inch silicone skirt. This black mask is fit for scuba diving and snorkeling. It measures 3 x 4 x 7 inches and fits on different face types. The accessory comes with a low volume design for free diving, easy to adjust straps and only weighs 0.15 pounds. This item is targeted at beginners and seasoned users and is ergonomically designed for maximum performance, safety and comfort. People also love its good design, portability, and simplify. Unfortunately, the nose pocket, according to some, is a bit small. 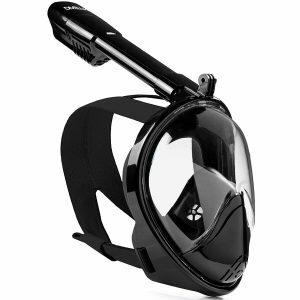 The Phantom Aquatic’s Panoramic is one of the stylish and colorful scuba diving masks around. Coming in a red/ black color and the patented 3/Tri-Window design, this accessory offers unobstructed views. It will fit most users courtesy of its 3 x 4 x 4 -inch dimension and feels light on the face due to its light weight of 0.9 pounds. It has a flexible buckle attachment and Revolutionary push-button buckle for quick and easy adjustment. For the perfect fit, the mask has a wide split strap and double feathered silicone skirt edge. The mask has a good fit, is comfortable, has great vision and is high quality but sadly misses a nose purge. 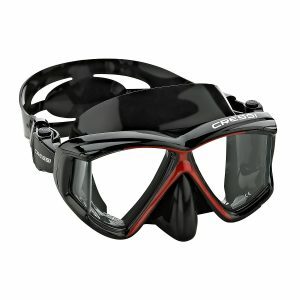 This black frameless mask is suitable for both snorkeling and scuba diving and should fit on most people’s faces. It comes in a decent dimension of 4 3.2 x 67 inches and consist of a quality tempered glass single lens. The unit offers clear wide views and features high quality 100% silicone for optimum support and comfort. Weighing 0.7 pounds, it’s among the lightest and won’t feel too heavy. The clear anti-fog glass requires minimal defogging while the micro-metric buckle improves comfort and adjustability. Consumers love its simplicity, lightness, and user-friendliness. Some, however, would have preferred if it came with a case. 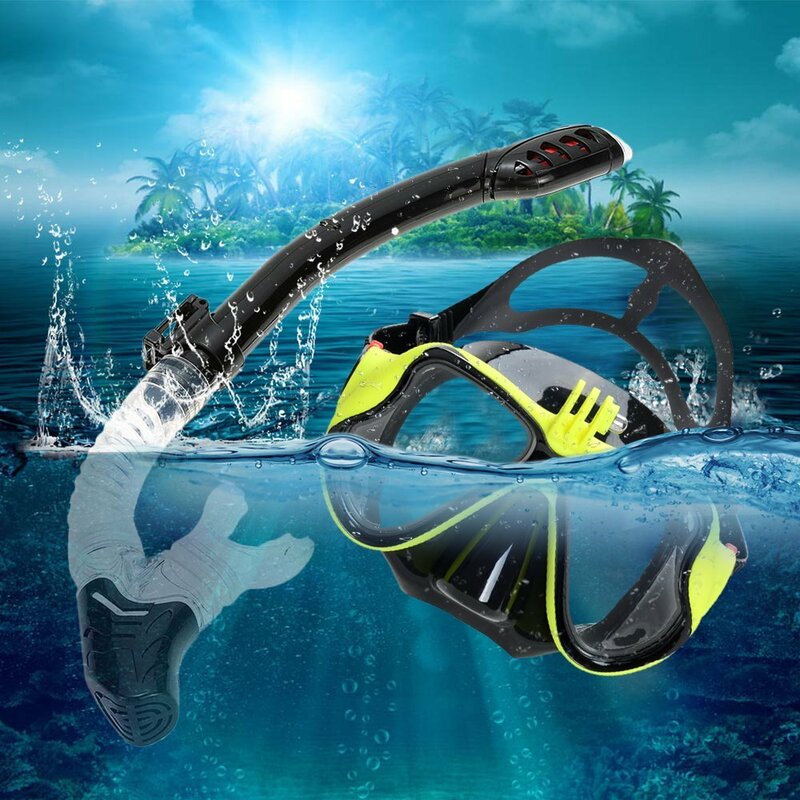 Snorkeling and scuba diving is more fun and convenient with this black mask by Divelux. Made from high-quality poly-carbonate plastic, this piece is resistant to scratches, breakage and offers 180 -degree panoramic views. The mask also features hypoallergenic silicone for better comfort and safety. It includes a long ventilation pipe, which together with the anti-fog glass ensures you have a great view. It snugs the face and prevents any water or moisture entering into the mask. Users love its light weight of 1.5 pounds, long ventilation pipe, solid construction and good clarity. Nevertheless, it’s not fit for small children. 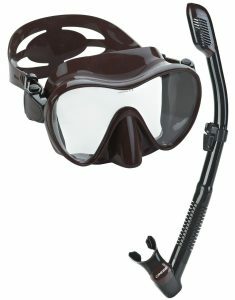 Make the experience count by including this Camo brown mask in your snorkel and scuba diving accessories. It comes in a sleek design courtesy of the tempered glass lens that has been molded on the 100% liquid silicone. the seamless design makes it watertight and also enhances the field of view. It comes in a low volume design for good performance, easy to adjust buckles, and swiveling design for versatility. The lack of a frame contributes to its light weight of 1.5 pounds while the easy-fold nature improves portability and storage. Reasons it features on this list include; great value, very comfortable, good sealing and compact (3.5 x 10 x 15.98 inches). The main downside is that it needs defogging occasionally. 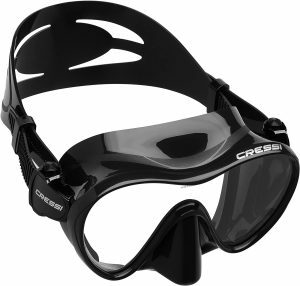 The Cressi dive mask is famed for its wide view that makes improves seeing in water. 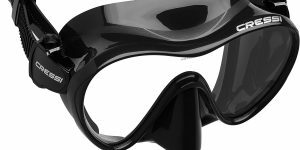 The black mask features 100% silicone skirts that are soft on the face and won’t let in any moisture of water. It also consists of a tough and long-lasting poly-carbonate frame and clear tempered glass lens. The mask measures 2.5 x 15.7 x 3 inches and has double-feathered skirt edge for good sealing and Quick-adjust ratcheting strap buckles. You should consider this mask because of its easy to wear, very comfortable, lightweight (1.15 pounds), and fits well. It may, however, feel a bit big if you have a small head. Scuba diving is more fun, productive and safer when wearing the right mask. Not only will you see where you are heading to but also protect your eyes and nose from water and other debris. To make life easier, we compared different products and listed them down. 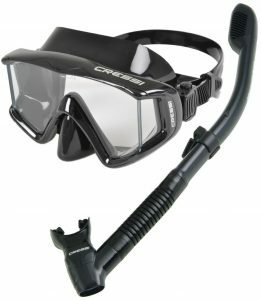 You will find any of these accessories suitable for day-to-use, amateurs as well as seasoned divers. They come in good design, decent size, are comfortable, ergonomic and are made from high-quality materials. 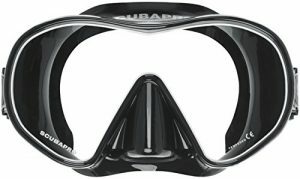 In addition to highlighting the best items, this top 10 best scuba diving masks in 2019 reviews also enlighten you on the important features. Make scuba diving a memorable and exciting experience by choosing the right mask.